We present a series of kits for carrying out various practical applications of the PCR technique, each kit consists of a theoretical part that the teacher work with students and a practical part consisting in PCR and results. The kits include reagents for conducting electrophoresis and staining (DANABLUE-FlashBlue or GELSAFE, if it is available a transilluminator). You must have a thermal cycler to carry out these practices. 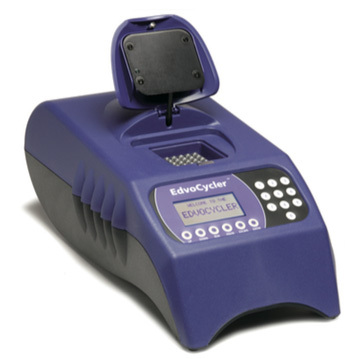 We can supply the EDVOTEK’s thermal cycler, firm that we represent. The DNA sequences that vary between individuals are known as polymorphisms. Students will prepare their own DNA from their mouth cells to be used for PCR and study the DS180 locus VNTR polymorphism. MIX PCR, positive control, agarose, TAE and DANABLUE-FlashBlue or GELSAFE (if it is available a transilluminator). Micropipettes, PCR, microtubes, and thermal cycler. Students will prepare their own DNA from their buccal cells to be used for PCR. In a second session, the amplified DNA is analyzed by electrophoresis and it is determinated the Rh factor. The DNA sequences that vary between individuals are known as polymorphisms.. Students will prepare their own DNA from their buccal cells to be used for PCR and study the presence or absence of Alu locus in gene activator of plasmimogen. This kit includes all material you need for the amplification of a fragment of the gene 16S rRNA of bacterial using the PCR technique. It is not necessary to isolate bacterial DNA, the kit is provided with a sample of bacterial DNA to perform the amplifications. This kit includes all material you need for the amplification of a fragment of the gene 18S rRNA of human using the PCR technique. It is not necessary the students isolate their DNA, the kit is provided with a sample of human DNA to perform the amplifications. This kit includes all material you need for the detection of transgenic Bt corn using the PCR technique. The kit is provided with several samples of corn powder and the material to the extraction of DNA from these samples and other possible chosen by the students. Corn powder sample, MIX PCR, normal DNA positive control, transgenic DNA positive control, agarose, TAE and DANABLUE-FlashBlue or GELSAFE (if it is available a transilluminator). This kit includes all material you need for the detection of transgenic soybean Roundup using the PCR technique. The kit is provided with several samples of soy powder and the material to the extraction of DNA from these samples and other possible chosen by the students. Soybean powder sample, MIX PCR, normal DNA positive control, transgenic DNA positive control, agarose, TAE and DANABLUE-FlashBlue or GELSAFE (if it is available a transilluminator).